Investing can be a great way to save for long term goals, like a wedding, buying your dream home, or preparing for retirement. Every year, you can invest up to £20,000 tax-efficiently, meaning you don’t pay any UK taxes on the returns you make. If you’re not sure how to get started with investing, Wealthify can help you get started in less than 10 minutes. Simply choose how much you want to invest and for how long (but you’re not tied in). Then choose for our five simple investments styles, to find a level of risk you’re comfortable with. Your investment plan is created by our team of experts who pick the most appropriate investments for you and then keep an eye on them. They’ll even adjust your plan from time to time if needed. You can check how your investments are performing 24/7 online or via the app. 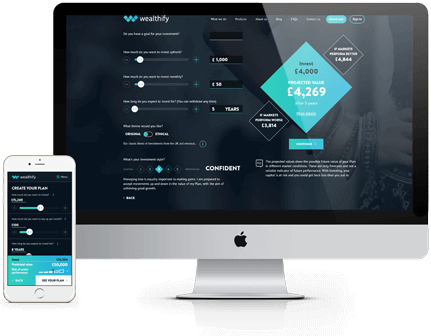 Your Wealthify dashboard shows you everything you need to know, including what we’ve bought and sold for you and which investments you hold. You can also top up your plan at any time via the dashboard in just a couple of clicks, or even withdraw money if you need to, without penalty. In return, you’ll pay a simple annual management fee of no more than 0.7% that covers everything we do for you. Annual fund charges and transaction costs also apply, which you can find out more about on our fees pages.